As Nick and Wendy described in the podcast – Episode 14: Orang-utans – they have visited four orang-utan rehabilitation centres in Indonesia and Malaysia. For this blog post, Nick has pieced together1 some snippets2 from his old emails and blog posts to bring you their experiences at three of these rehabilitation centres. Unfortunately he didn’t write about the fourth one! The best thing Wendy and I have done since I last wrote was to visit the orang-utan rehabilitation centre in Bukit Lawang. The purpose of the centre is to recover domesticated orang-utans (apparently they are often sold as pets for up to US$40,000 each) and re-teach them how to live in the wild. The animals are kept at the centre for at least six months until they’re ready to be released into the Gunung Leuser National Park, which is basically next to the town. 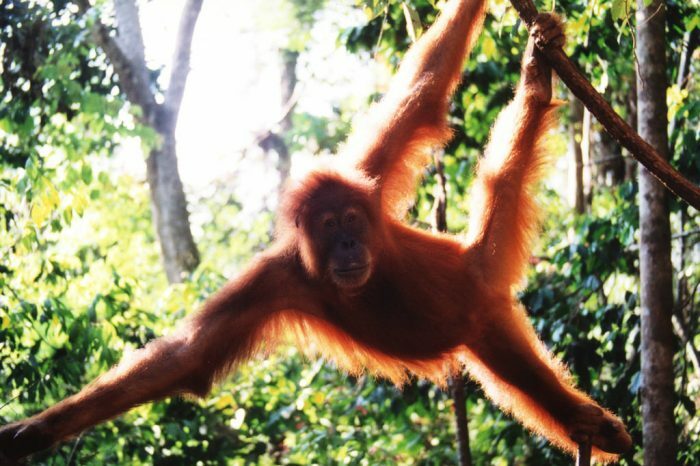 Of course, this also helps to increase the population of orang-utans, who are native to only Sumatra and Borneo. The centre has a “feeding station”, which is actually just a clearing in the forest, where they provide food twice a day for the recently-released animals who still aren’t used to getting their own food. So the park rangers take tourists into the jungle to see the feeding. 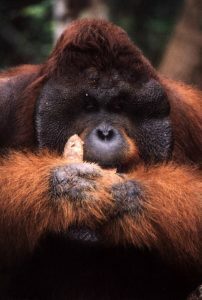 During our session, we saw about 10 orang-utans of all different sizes and ages, and I was enthralled by them. It’s beautiful the way they swing from tree to tree and hang by the branches. Seeing them was the highlight of Indonesia so far for me and probably the most enjoyable photographic experience I’ve ever had. The ones we saw are used to humans and so were quite tame, but we were told to look out for one named Eddy who had stolen a backpack from a tourist the previous day. He swooped in3 and frightened away another orang-utan, and I started to have visions about Edgar Allan Poe’s story, “Murders in the Rue Morgue”4, but all he wanted was a handful of bananas. Our final destination in Kalimantan was our last jungle in Indonesia, the Tanjung Pitang National Park. It was a different experience from our other jungle trips, and by far the best one. The only access to the park is by river, so instead of trekking up mountains like before, we were able to hire a small boat and crew and cruise5up a narrow river for two days with jungle on both sides of us. There is an orang-utan rehabilitation centre in the park, so we were able to see plenty more of those wonderful creatures. In addition to seeing them around the feeding stations – including seeing our first “King”, or fully-grown male – we also spotted three, and one baby, from our boat while we were meandering up the river. There were also loads of6 monkeys in the trees on the river’s banks, including the proboscis monkey, found only in Borneo. It was funny to us that in four days in the Kerinci National Park in Sumatra we saw not a single monkey and in half the time in Tanjung Pitang we saw literally hundreds. Overall, the river trip through the park was possibly the best experience we’ve had in Indonesia. There aren’t too many better things you can do with an afternoon than to sit on a boat deck, spotting rare and endangered primates while floating up a beautiful river. Yesterday we went to the orang-utan rehabilitation centre at Sepilok. Of the four of these centres that exist on Borneo and Sumatra (the only two islands that orang-utans live on), we’ve now been to three. 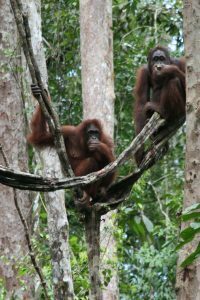 Sepilok was by far the most developed and offered the best facilities, but was also naturally the most touristy, with about 200 people watching the morning feeding session of the rehabilitated orang-utans from platforms some distance away. (In Tanjung Puting National Park in Kalimantan, we were the only ones there, and at both Indonesian centres you can get really close to the animals). So while yesterday wasn’t as enjoyable as the other two rehabilitation centre experiences we’ve had, it’s always fun to see orang-utans, and we’ll hopefully see some more in the wild over the next couple of days. I hope you enjoyed this post. 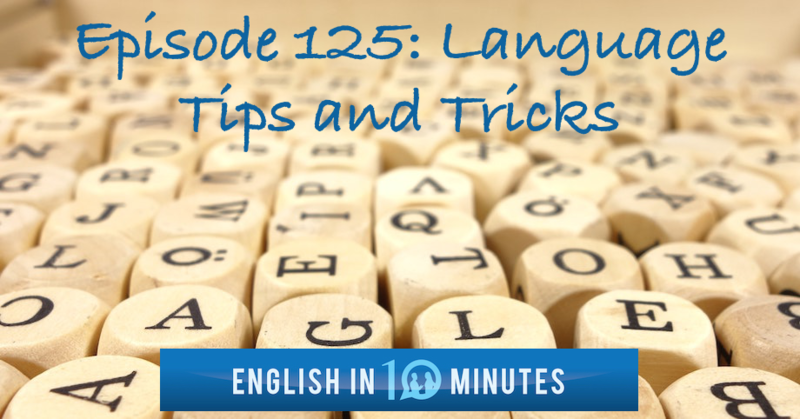 Click here to listen to the podcast episode in which Nick and Wendy talk about orang-utans.